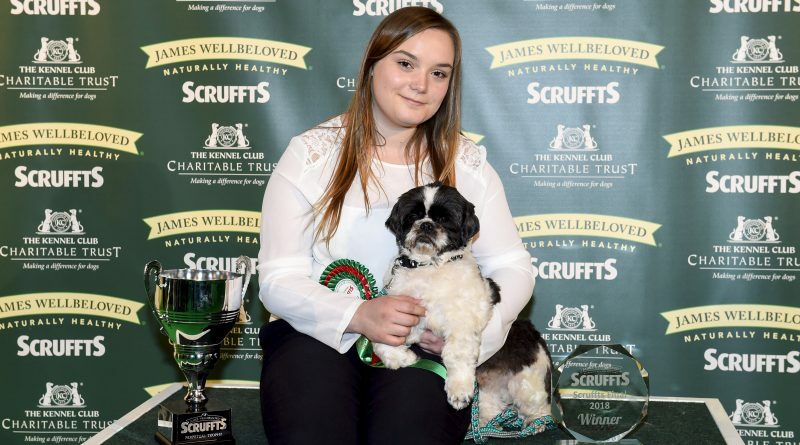 Jack, a Shih Tzu/Maltese cross owned by 16 year-old Young Kennel Club (YKC) member Josie Baldwin from Deal, Kent has won the Scruffts Family Crossbreed Dog of the Year title at the world’s greatest dog show, Crufts on Saturday 10th March. Five year-old Jack was one of six crossbreed finalists in the national Scruffts competition, which is exclusively supported by pet food makers James Wellbeloved. Hundreds of dogs competed in qualifying heats around the country, but only six lucky dog owners, who won their class at the semi-finals at Discover Dogs in London last October, were able to head to the final in the main arena at Crufts. Josie had wanted a dog since she was six year-old and after pleading with her parents for a long time, one summer they finally agreed, so long as she trained the dog properly. Before getting Jack, Josie was extremely shy, she found it very difficult to talk to people and found them frightening. But getting Jack gave her the confidence to speak to people and not shy away. When she took him to classes and dog shows she had to interact and chat with people and their dogs, which really helped build her confidence. Josie began training Jack at the Happy Hound Puppy and Dog Training club in Kent. Shortly after attending puppy classes, she began taking him to Kennel Club Good Citizen Dog Scheme classes, where they achieved their bronze, silver and gold awards. She also competes in competitive obedience and agility with Jack. Thrilled Josie said: “It’s amazing to win. I thought I would be nervous but I was really excited. I never thought I would be competing at Crufts and I really didn’t expect to win. “Jack is amazing, there’s no other dog like him. He’s one of a kind – he’s good at obedience and agility although he can be a bit stubborn at times. “I used to not like talking to people but he’s helped me do more of that as well. Scruffts gives crossbreeds the chance to shine and it’s amazing. TV Personality and dog lover Judge Rinder as well as renowned dog judge Frank Kane judged the six finalists on qualities such as good character, health and temperament with people and other dogs. On the difficult decision of choosing the winner, Judge Rinder said: “This is one of the hardest judgements I’ve had to make because everyone was such a worthy winner. The Scruffs Family Crossbreed of the Year competition is run by the Kennel Club, which organises Crufts, and caters exclusively for crossbreed dogs: dogs whose parents are of two different breeds, or a mixture of several breeds. Throughout 2017, 15 heats of the popular Scruffts contest took place at events around the country in search of crossbreeds with that extra special something. During the course of the year, over 1,300 dogs took part, raising nearly £4,000 for the Kennel Club Charitable Trust and the chosen charities of the heat hosts. The winners of each heat received delicious James Wellbeloved goodies for their dog. As well as the Scruffts Crossbreed Family Dog of the Year title, Jack received a year’s supply of healthy hypo-allergenic dog food from James Wellbeloved. James Wellbeloved marketing director Alison Sudbury said: “Huge congratulations to Jack and Josie on becoming Scruffts champions. James Wellbeloved is very proud to be exclusive supporters of this wonderful competition which celebrates the nation’s most fabulous crossbreed dogs. To enter one of the 2018 heats, please visit the Crufts website to find one near you. Catch Jack and Josie, the other finalists and more lovable crossbreeds in Scruffts: Britain’s Favourite Dog which will be airing on Channel 4 on Friday 16th March at 8pm.